When you pick up a book promising contents that are like a mixture of James Bond and Sherlock Holmes if it were written by Tolstoy, there has to be at least a little part of you that is intrigued by that description. That's pretty much the sole reason that I picked The Winter Queen up really, curiosity and a desire to see if it can live up to the big claims made on its behalf. The Winter Queen starts with an unpleasant but seemingly innocuous event, when a wealthy student shoots himself in the middle of a public park in Tsarist Russia, amongst scores of witnesses. The papers dismiss the incident as an unfortunate consequence of the youths of the day's seemingly endemic selfishness. But a young police officer by the name of Erast Fandorin sees the incident and, following a weird gut instinct that he has about the whole affair, finds that there may be something far more sinister afoot than initially meets the eye. 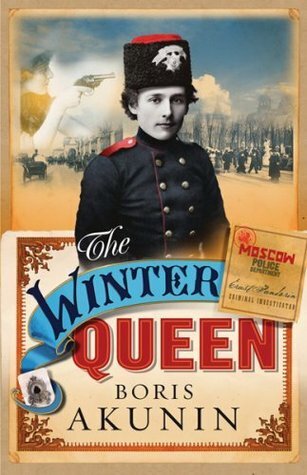 He begins to uncover a plot that will take him from Moscow all the way to London and back. I'm really not sure how to consider The Winter Queen. On the one hand, I like that the story is tightly plotted and at times incredibly tense; on the other, I find something of the coincidences to be really quite outlandish even for a cosy mystery. On the one hand, I like Fandorin because he seems genuinely sweet and gentlemanly and kind of dorky; on the other hand, his perceptiveness is easily matched and perhaps overwhelmed at times by his incredible lack of perception when it comes to people and their true motives. The vast majority of me wants to recommend this book, because the plot is genuinely interesting with an ending that is completely out of left field and totally gripping because of it. Additionally, Erast Fandorin is a detective unlike any other that I've seen: a little bit vain, more than a little foppish, incredibly earnest and overwhelmingly sweet and good-natured. These are things that I can look at and say "This is a book that entertained me and left me wanting to continue reading the series." But then I can't deny another voice, almost as loud, that leaves me unsatisfied. While the plot is well-written, it can feel a bit predictable at times, the ending aside. You learn fairly quickly that if Fandorin appears to be doing well, then he's missed a factor and is about to be sorely disappointed. That leads me nicely to my next point: while he is a detective like no other, that's also a fairly major negative for me at times, as it means that he's really not very good at times. Honestly, other than some admittedly good thinking in his few brief moments of peace and quiet, he has a habit of doing some really stupid things. He doesn't seem to understand that he isn't as good at tailing people as he thinks he is, and has a really bad habit of judging people by their appearances even after he should have realised that suspicion is a good trait for a policeman to have.